My husband and I used Patio warehouse to build our 18X18 feet roof mounted patio cover. We went with the brown ( wood) color and we are really satisfied by the look and feel. Patio Warehouse was really professional from the first contact to the set up of the patio. We received a free estimate during their first visit, then a follow up list before the set up which was really smooth and last exactly the time we have been told. The set up team was really efficient and gave us really good advise ( Freddy and Victor in particular). We highly recommend Patio Warehouse. We are looking forward spending the summer hanging under our brand new addition ! With Patio Warehouse you get what you pay for, great service and high quality product. It is worth the extra $$. 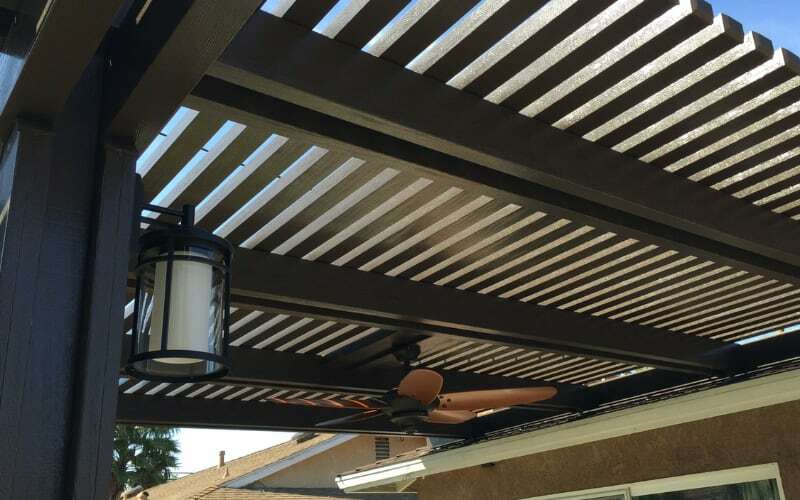 We are thrilled with our new patio covers – solid panel with skylights, fans and heater outside our family room, and lattice cover over rest of patio outside of kitchen. We have spent more time outside on our patio in the last couple weeks than we have in years. Looks amazing, love the skylights. Installation was a breeze – quick and efficient. Any questions, issues quickly resolved. All in all, we are loving our new outdoor space and enjoying every minute – it’s like adding another room to the house, only better! Patio warehouse did a fantastic job in my backyard. The Ellite wood looks amazing. The staff was really nice and easy to work with, and the installers were amazing guys. They worked in the rain so they would get the job done on time. They wouldn’t take no for an answer. You can’t find service like that very often. Easily a 5 star company!